NO ONE IS ALLERGIC TO IODINE. THEY WOULD BE DEAD. Yet we are told it is dangerous. NO ONE IS ALLERGIC TO SULFUR. THEY WOULD BE DEAD. Yet we aren’t told anything about the importance of sulfur to our health. When we are told we are allergic to SULFA, it is most likely in reference to SULFA MEDICATIONS, and it has nothing, absolutely NOTHING to do with sulfur. Sulfur is the 8th most common element in your body as it is mine. Sick people are deficient in sulfur. In this group, what we are working on doing for ourselves, is finding the most basic essentials that our body needs, and then getting out of the way and letting our bodies do their jobs. This isn't to say you might not have a reaction to sulfur if you started taking a bunch of it, because you would have a reaction, and it might be bad. However, the reason why you would be having a bad reaction will probably have almost nothing to with the truth. You would most likely be having a reaction because that sulfur might move so much mercury, probably put into you by the Healthcare system (HC Devils), that it could kill you, or at least make you feel terrible. The HC Devils know this, and this is how they make their money. They do not make money by encouraging people to take Epsom salt baths to detox mercury or to eat more SALT and fight infections. The HC Devils are in the business of treating symptoms, and they do this by conveying half-truths. They use poisons as medicines and then treat the symptoms of their poisonings. I am not big on testing, I am big on gut health and gut intuition. I ask how do you feel, not what are your test results? I ask what are you taking for yourself, not what have you been prescribed? I ask you to make decisions based on your learning, I don't ask you to blindly follow my lead. I ask you to proactively chart your own course for the future, not what are the results of your genetic testing. We are all mutants, and all of us mutants need the essentials to human life, and the more toxic we are the more of these essentials we need to get our body back to balance. This is a Holistic Approach. I am not treating symptoms. Symptoms are treated by the other guys. To clarify, it can be very difficult for people to understand this, especially when the HC Devils are prescribing medicaments that are keeping your symptoms at bay, and the longer they have been keeping them at bay for you, the more difficult it may be for you to let go of them. Most of their medicaments, that is a real term for prescriptions, inhibit your detox of mercury. The HC Devils are not shy about naming their medicines after what they do, and most of them are inhibitors. They inhibit your ability to detoxify yourself. They freeze toxins like mercury in place, and you will not detoxify if you remain on their medicaments, or at least it may be very difficult for you to fully detox. I want to help you, even if you are not fully committed to my side of the fence. However, I want you to know I'm very aware of people trying to ride the middle of the road. I NEVER go over to their side. I never cross that line. Lying between our side and theirs is a dividing line, a barbed wire fence if you will, and I see many people get hung up on that fence. I want you to know I did NOT put that fence there, the HC Devils put that fence there, and they seemingly move the fence at will, graying out the surrounding area as it catches a lot of prey. It's incredibly profitable for them to do this. The most profitable industry on Earth is the Healthcare Industry. I didn't put mercury in you, they did. 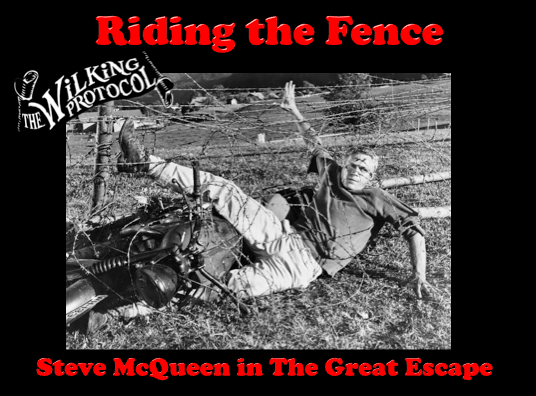 I suggest you get away from that fence as soon as you can, and stay away from it.